There could be no wearing of clothes without their laundering, just as surely as there could be no going without clothes, not in Hertfordshire anyway, and not in September. Washday could not be avoided, but the weekly purification of the household's linen was nonetheless a dismal prospect for Sarah. "If Elizabeth Bennet had the washing of her own petticoats, Sarah often thought, she’d most likely be a sight more careful with them. In this irresistibly imagined belowstairs answer to Pride and Prejudice, the servants take center stage. Sarah, the orphaned housemaid, spends her days scrubbing the laundry, polishing the floors, and emptying the chamber pots for the Bennet household. But there is just as much romance, heartbreak, and intrigue downstairs at Longbourn as there is upstairs. When a mysterious new footman arrives, the orderly realm of the servants’ hall threatens to be completely, perhaps irrevocably, upended. Jo Baker dares to take us beyond the drawing rooms of Jane Austen’s classic—into the often overlooked domain of the stern housekeeper and the starry-eyed kitchen maid, into the gritty daily particulars faced by the lower classes in Regency England during the Napoleonic Wars—and, in doing so, creates a vivid, fascinating, fully realized world that is wholly her own." I heard about Longbourn on Goodreads and immediately wanted to read it. I was lucky enough to obtain a review copy from Knopf Books, and I wasn't disappointed, even though Longbourn was a bit different than what I was expecting. Jo Baker doesn't really try to imitate Austen's style, unlike most books spin-offs. But then, this isn't really a spin-off, not as we know it. It's more like a revelation of what the other side of Pride and Prejudice was. It's something I've often wondered about, about how the servants at Longbourn and other places lived, and what their relationships to their employers were like. Well, Longbourn answers that question, and exceedingly well. The writing is rather distinctive, and unlike Austen, there's a lot of description, which I rather liked. After all, so many aspects of the servants' lives are so foreign to the modern reader, and some parts of the book would have been a little confusing without the elaboration. Unlike the plot summary says, Longbourn isn't "the answer" to Pride and Prejudice; it's just a look at what's hidden underneath those fine ladies and gentleman, at the people who wash their clothing and empty their chamber pots, who rise at four thirty in the morning and go to bed at eleven. It's a grueling schedule, and it made me wince to read about, especially considering what little work even people like the Bennets did. Nothing, really, and indeed in Pride and Prejudice Mrs. Bennet is offended at the idea that her daughters would cook a meal. The Regency class system really comes to light in this book. Longbourn also provides some insight into the already established characters of P&P, painting a clearer portrait of them from the servants' perspective. This is also enhanced by little snippets from the original novel at the beginning of each chapter; they kind of tell the reader what to watch out for. For example, in a chapter featuring Mrs. Bennet, the quote reads "the business of her life was to get her daughters married; its solace was visiting and news." These stand in place of chapter titles. Longbourn also holds plenty of new and interesting characters, such as the enigmatic new footman who Sarah dislikes and likes at the same time. Sarah narrates most of the book, although it is in omnipotent third person, so sometimes Jo Baker writes from the perspective of Mrs. Hill, James, or one of the other servants. Sarah herself is mentioned but once in P&P, when Mrs. Bennet frantically shouts for her to "come to Miss Bennet this moment, and help her on with her gown." I thought I remembered that detail, and was happy that the author picked up on it. The book isn't witty or wry like Jane Austen's novels, and the story doesn't consume you quite as much, but I still really wanted to see how the book unfolded and how Jo Baker would portray the novel's events from the servants' point of view, which is obviously vastly different. They also know about some events, but not others. 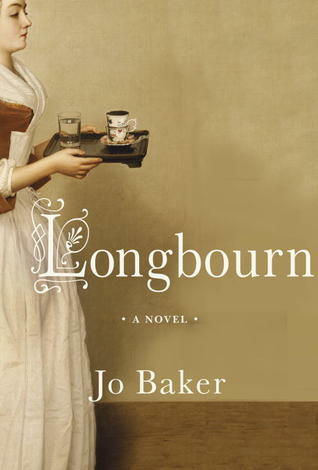 Although I am not one of them, there are many people who completely romanticize Jane Austen's world and want to be Elizabeth Bennet, and books Longbourn remind us of why exactly the early 1800's were a pretty terrible place to live in. Women had no rights, and unless you were a member of the upper class, life pretty much sucked. There's an interesting section at around page 56 when James drops the ladies off at the assembly, and it shows the vast difference between what happens in the light and outside and how the coachmen waiting outside interact, living in squalor. There's actually a couple-second scene like this in the 1995 adaption of Pride and Prejudice, probably where Jo Baker drew it from. It's sections like these that really make the novel shine. As others have commented, Longbourn does really stand on its own as an excellent historical novel about class and social situations. Non-Austen fans may enjoy it too, and I loved its portrayal of a different, more realistic side of the story. I also just really enjoyed how the familiar characters were developed and explored in interesting new ways, and I would definitely recommend this very creative book. You can read another review here.